Pickleman is busy at work on his next adventure. Stay tuned for news Fresh off the Vine! Back by popular demand and personal invite, "Dillzilla:Titan of Terror!" will be shown Friday, January 12th as the sweet and sour treat before the showing of the horror classic, "American Werewolf in London." Yes, fans of all ages enjoy silly horror, panicking people and rampaging pickles! Then, on Saturday, January 13th, at 4pm, there is a colossal showing specifically for the sweet petites and parents. Pickleman will be there in person to meet, greet and speak all about the tricks of the trade in creating a masterpiece of miniaturization, deep focus, underwater shooting and battlefield action shooting. For more information on MarsCon 2018 click here. Pickleman is proud to be included in The New York Women in Film and Television Fall Shorts Festival 2017! The big dill is getting known in the Big Apple! To sample a taste click HERE! Martians will experience the film unlike any other That’s right, “Dillzilla:Titan of Terror!” is stomping its way into Williamsburg, Virginia. This could be your chance to witness Pickleman grow 100 feet, tall, attack a small town and confront the National Guard! All this and more brought to you in awe inspiring DILLoVISION! And always, anything starring Pickleman is Kosher for all ages! Pickleman wants to thank all of his fans and especially those who took roles in his latest adventure, "Dillzilla: TItan of Terror!" Only the purest and most imaginative sort are willing to run in the rain, screaming in terror from an imaginary pickle. These folk are the best and must be recognized and appreciated. For their unselfish commitment has helped films be created throughout the ages. On October 7, Saturday, at Monster Fest Chesapeake 2017, Pickleman will be present to reacquaint and to thank any pickle lover . "It's a particular pleasure to partake in the joy, the education and all round silliness that is Monster Fest!" 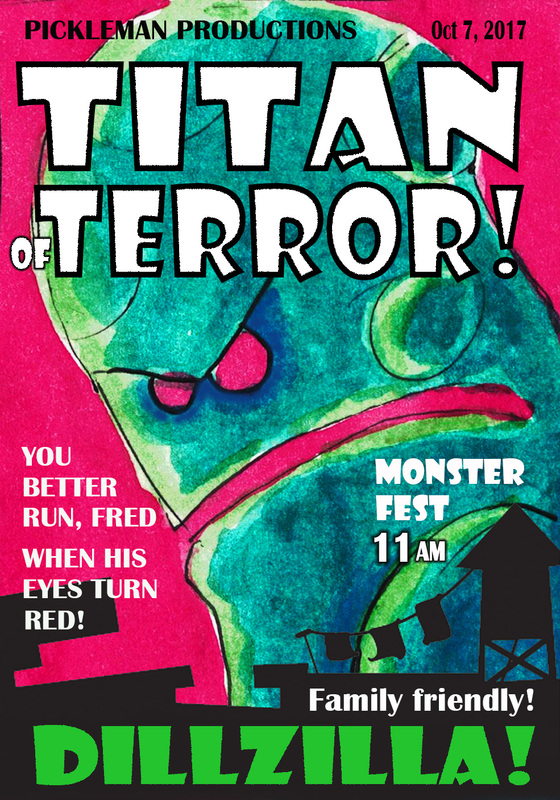 Be sure to bring the whole family out to the affair and to watch my film, "Dillzilla:Titan of Terror! And remember, anything starring Pickleman is Kosher for all ages!" Dillzilla: Titan of Terror! is premiering at the Queens World Film Festival! The film has also been nominated for the Best Family Friendly film. It is an honor to be included in such a stand out festival filled with incredible films from around the world. This festival like Pickleman, overflows with heart, conviction and cinematic celebration! In Dillzilla: TItan of Terror! Pickleman is infected with a powerful substance which causes him to grow when angry. Can he find a cure to his peculiar predicament before he grows beyond control and destroys his beloved town? Dillzilla brought many new challenges to our plate. This film demands special effects shooting and outside of the box thinking. Our challenge was to spoof 1950’s horror films and yet when utilizing effects we want to inspire the eyes, mind and soul. We kept the designs to a basic, clean and instant readability. We researched old films and studied the techniques of the great masters before us. Their work was limited by small budgets and quick deadlines. The use of deep focus, split screen, forced perspective, model sets and stop motion were all used then and now. An asteroid crashes onto Ma's farm, infecting her compost heap. Will Pickleman survive the attack from the decaying, toothed cucumbers? Watch and witness the final outcome?